Still stuck on setting up your first campaign? Not sure what to include in your brief? Check out this sample campaign from one of the brands on Hey Influencers - Pérla. Pérla is the go to brand for modern and natural teeth whitening essentials. Established in Melbourne in 2015, Perla has a strong product portfolio of peroxide-free teeth whitening products, as well as a relaxing, spa-like physical treatment centre for the full, pain and anxiety free teeth whitening experience. 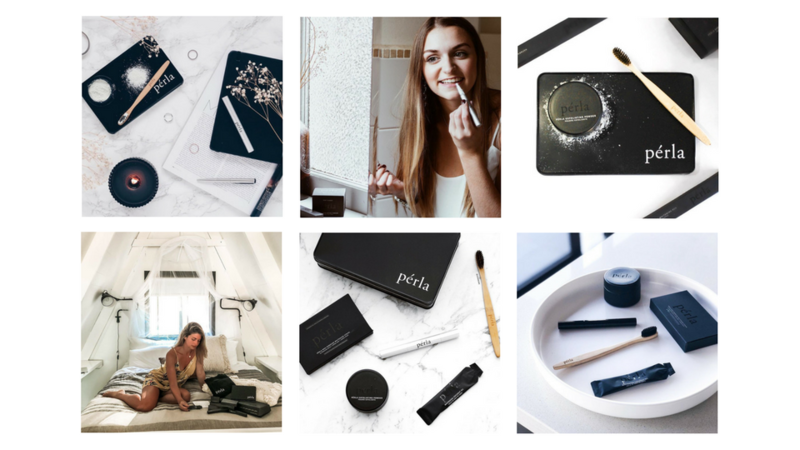 Looking to broaden their reach and generate buzz about their products with micro influencers, Pérla opted for a 'product for post' campaign. Choosing your campaign type is quite straight forward - you will be asking for influencers to either try your product, leave a product review, go to a venue etc, depending on what kind of product or service you have. ‘Luxury teeth whitening brand Pérla are looking for girls + guys to try their range of peroxide-free teeth whitening products. We'll do the gifting, you do the gram'ing. This is a great example of a short brief that still communicates all of the essential information about the brand, the product, and what we are asking influencers to do - i.e. post about the brand in exchange for product. Tip: Although you will not see line-breaks in your campaign preview, the line breaks will appear on the app when influencers view the campaign. For Perla, we selected the ‘product’ option, as we are offering to gift product in exchange for 1 x social post and 1 x Instagram story. If you are running a ‘product for post’ campaign, make sure you tick the ‘product’ box. If you’re running a paid campaign (i.e. you are offering to pay your influencers) then tick the ‘price’ box. Only fill in the budget section if you are running a paid campaign. Enter your minimum and maximum budget per piece of content/per post here. These amounts are for your own reference - however, when an influencer views the brief for your campaign, they will see dollar signs ($) in the top left to indicate that it is a paid campaign. The number of dollar signs shown indicates the level of budget. I.e. One $ sign means a small payment is on offer. Five $ signs means a large payment is on offer. All of the above specifications ensures that there are no grey areas, and the brand and influencer are on the same page upfront - avoiding any issues with regards to acceptable content later. Finally, choose whether you want to make your campaign public, or private. We chose to make Pérla’s campaign public so that all influencers who fit the location and niche specifications will see the campaign in their feed, and can express interest in working with Pérla by tapping the ‘Hey’ hand on the campaign. Perla can then check their dashboard to see which influencers are interested and send them a ‘Hey’ back in order to start chatting and working with them. If you chose to make your campaign private, it will mean that your campaign won’t appear in the feed of influencers, and only influencers that you ‘Hey’ will be able to see the campaign. You can search and ‘Hey’ influencers by clicking the ‘Find’ tab on your dashboard once you’ve finished setting up your campaign.